We have sampled and reviewed many whiskies over the last year at Whisky For Everyone, so we have decided to choose our top 10 of the new releases that hit the market in 2009. With so many whiskies to choose from we have called in the help of Chris Maclean - the esteemed manager of The Whisky Shop's London branch and a selected judge in the whisky category of the recent Spirits Business Magazine Awards. Top 10s are always contentious issues as everyone has differing opinions. We have tried to select our Top 10 on quality, value for money and availability to the public. To this end, there are not really any single cask or independent bottlings included despite some excellent ones being sampled throughout the year. Some however are limited edition bottlings that are still available to purchase. Here is the second part containing our Top 5, including our 'Whisky of the Year'. If you missed Part 1 (containing numbers 6-10), it can be read by clicking here. This whisky was released in the late Summer by Speyside's smallest operating distillery. This has a surprisingly rich, smoky nose. First comes vanilla and toffee aromas before giving way to an earthy peatiness. These elements combine well and there is also dried fruits (imagine sultanas) and dried grasses. On the palate, this whisky is rich, full bodied and quite creamy with initial sweet malty cereal grains and vanilla notes. Then comes that lovely smokiness again, although it is a bit more ashy and ember-like than before. The cereal, vanilla and smoke mix perfectly with some further dried fruits (add some tropical dried fruits, like mango, to the sultanas), buttery toffee and a hint of dried grassiness. This feels thick in your mouth and is smooth and very well balanced. The finish is reasonably long with the creamy vanilla and sweet smokiness prominent. This offers rich, classic Speyside characteristics but with the smoky twist. A fantastic all round dram and the great value for money that it offers, makes this our 'Whisky of the Year 2009'. This whisky from the iconic Talisker distillery on the isle of Skye formed part of Diageo's Autumn Cask Strength limited releases. The nose is very fresh for a whisky of this age and has a complex mix of dried fruit (sultanas and candied orange peel), saltiness (imagine seaweed) and subtle spicy smokiness (think of black pepper and nutmeg). There is also toffee and a touch of earthiness. This feels thin and silky on the palate with a sumptuous vanilla sweetness combining well with delicate light smoke (imagine wood ash/embers), a salty element (brine again) and dried fruits notes (although these are less prominent than on the nose). This drinks very well at the natural strength, although adding a touch of water does bring out some sweet earthiness (reminiscent of damp moss). The finish is long with some honey and dried fruit sweetness with a whiff of smoke and spice. Wow - this is one exceptional and complex whisky. One of the new releases this year from the famous Highland distillery of Glenmorangie, this has been part matured in Pedro Ximinez sherry casks. It was released in the Spring to the Duty Free/travel retail market and the great news is that it will be on general release in the new year. The nose is fantastic and delicate with a combination of caramel-like sweetness, dried fruits (raisins and candied orange peel), something dark (imagine high cocoa chocolate/espresso coffee), vanilla and sweet malted barley. On the palate this explodes on your tongue and is full bodied, viscous and creamy. An intense pleasant sugary burst hits the front of your tongue, dying slowly to reveal the elements from the nose - a great mixture of vanilla, caramel/ dark brown sugar, dried fruits (some apricot this time), a nuttiness (imagine coconut), bitter dark chocolate, coffee and a tropical fruit element (something like mango/papaya). The lengthy finish is intensely sweet, complex and fruity with some cinnamon spice coming through. Sonnalta is a top quality and well balanced 'try before you die' whisky. A fantastic dram. This whisky from the cult Ardbeg distillery on the western isle of Islay was released in September and replaced the popular Airigh Nam Beist in the core range. The nose is robust and aromatic yet inviting. There is smokiness and sweetness in abundance (think of earthy peat and sugary caramel). There is also a fresh grassy note, dried fruit (think of sultanas and candied orange peel) and a whiff of bitter iodine. On the palate, this is rich and full of character. Again, there is initial powerful smokiness and a burst of sweetness. The sweetness is more than on the nose but also has a slight bitter edge, like burnt sugar. The dried fruit note is present again and is joined by a hot spicy element (quite peppery and fiery, like a red chilli) and a salty tang. The finish is very very long and full of peaty smoke and hot, spicy heat, feeling drier than the sweeter nose and palate. When water is added, the nose and palate became sweeter (think of brown sugar) with more fresh crisp green fruit (imagine pears and apples). The finish is also sweeter and shorter but less complex and younger. Corryvreckan is a very impressive smoky whisky that will gain Ardbeg further admirers. If you love smoky whiskies, you have to try this. 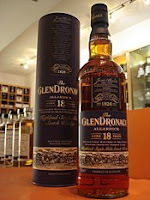 Glendronach was restarted in 2008 and the new owners wasted no time in expanding the profile and range of its whiskies. This whisky hit the shelves in early Summer along with a new 15 years old. It isexclusively matured in Oloroso sherry casks and is sweet and malty on the nose with a lot of that sherry cask influence - dried fruitiness (think of sultanas and peel especially), malted barley, warm spices (imagine nutmeg and cinnamon) and oaky woodiness. The palate is thinner than the richness of the nose suggests. Dried fruit and malted barley combine well to give it an almost perfect level of sweetness. Other elements present include some sugary caramel, those warm spices again and a distinct nuttiness (think of walnuts) that gives a slight bitterness to balance the other sweetness. The finish is quite short, woody, dry and slightly bitter with some candied peel coming through (orange especially). A lovely dram that gives everything that you would want from a sherry cask whisky. To complete and re-cap the remainder of the Top 10, here is the list of numbers 6-10. These are fully featured in Part 1. So, there we have it. 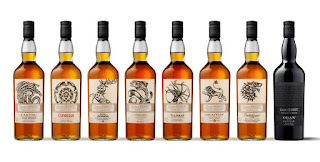 That is our Top 10 of the new whisky releases from 2009. However, there are others that deserve honourable mentions - Ardbeg Supernova, Caol Ila 10 years old Unpeated Cask Strength, Connemara Sherry Finish, Glenmorangie Signet, Glen Moray 8 years old Red Wine Cask, Kavalan Solist and Kilchoman 3 years old to name but a few. Let's hope that there are as many excellent releases in 2010. We would be interested to hear your nominations for the best whiskies of the year, so please add your comments at the bottom of this post. This whisky was introduced to replace the popular 15 years old in Laphroaig's core range. The famous distillery on the western isle of Islay took a gamble by doing this but it paid off. The nose is fresh and clean with an instant hit of pungent aromatic smoke (imagine damp moss and dry peat). This is balanced with vanilla, a briny saltiness and honey. On the palate, it is robust and powerful offering early sugary sweetness that combines vanilla and honey with malty cereals and spicy woodiness. The smokiness is less earthy and more like charcoal or burning embers/ash with some saltiness and a bitter iodine twist. The finish is very long with a bittersweet mix of vanilla, honey, warm gingery spices and pronounced smokiness that reminded us of creosote fence paint. A classic smoky dram. 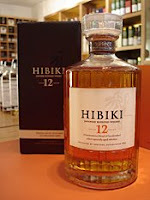 A Japanese whisky that was released to compliment to well known and well loved Hibiki 17 years old (made famous by Bill Murray in the movie Lost in Translation). The owners, Suntory, kept the distinctive decanter style bottle but that is where the similarities end. It contains single malts from the Yamazaki and Hakushu distilleries plus aged grain whisky. The main difference is that it has been part matured in Umeshu (a type of Japanese plum wine) casks. This has a very promising nose - it is fragrant with fresh stone fruit (like cherries and plums), plus vanilla, honey and hints of peppery spiciness (imagine ground white pepper). The palate is refreshing, cleansing and mellow with lots of fresh juicy fruit notes (especially the plums) combining with vanilla and barley sweetness. It has a crisp, short finish with peppery spice coming through. A lovely clean, fresh whisky that makes you want another sip! This bottling by the iconic Lagavulin distillery on the western island of Islay formed part of drinks giant Diageo's annual Autumn Cask Strength limited releases. The nose is intense and full of peaty, earthy smokiness (reminiscent of wood embers and ash). This is joined by a mix of caramel, vanilla, toffee, some saltiness and a citrus element (imagine lemon zest). On the palate, this is full bodied with smokiness marrying perfectly with sweet barley, briny saltiness, caramel and something nutty (imagine hazelnuts). With water, the whisky opens up releasing more smoke and salt with a pepperiness coming through. The water also brings out fruity elements (think of tinned fruit, pears especially). The finish is long, drying and intense with that earthy, peaty smoke fading slowly. An excellent and complex whisky that is a real bargain for the price. Released in the Autumn and was long awaited as it represents the first time that the Dalmore distillery have officially bottled an 18 years old. The nose is very pleasant, sweet and rich with plenty of malted barley that is quickly joined by the classic sherry cask characteristics - dried fruits (think of raisins and sultanas), candied peel (especially oranges), nuts (imagine walnuts and almonds) and caramel. On the palate, this is full bodied and silky with plenty of sherried dried fruit, especially raisins, and this is complimented by a lovely woody, nutty spiciness ( a combination of cinnamon, nutmeg and walnuts). There are also other elements - slightly bitter candied orange peel, caramel, vanilla and a hint of dark plain chocolate/cocoa powder and roasted coffee. The finish is rich, fruity (the dried fruit/candied peel again) with warm spiciness (imagine cinnamon and cloves). This is a lovely, rich and smooth whisky. 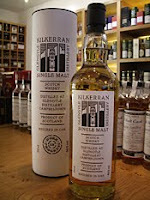 Kilkerran is the first official single malt release from the new Glengyle distillery in Campbeltown. The whisky may only be five years of age but we believe it shows great potential and had to have it in our Top 10. The colour is light and straw-like, with a nose that is highly aromatic and full of promising youthful vibrancy. There is a mixture of sweet cereal grains, fresh green fruit (think of pears and apples), something powerful and herbal (imagine dried grasses) and a whiff of peppery peat smoke. On the palate it feels creamy in the mouth and the cereal, green fruit and grassy elements from the nose are joined by a sugary sweetness (imagine icing sugar), vanilla and zesty citrus (think of lemon and orange). The finish is long with a hint of earthy smokiness and woody oak coming through, before turning slightly harsh and spirity right at the end. A very pleasant and highly characteristic whisky that may be robust, youthful, vibrant and not to everyone's taste. Watch out for future releases with interest! 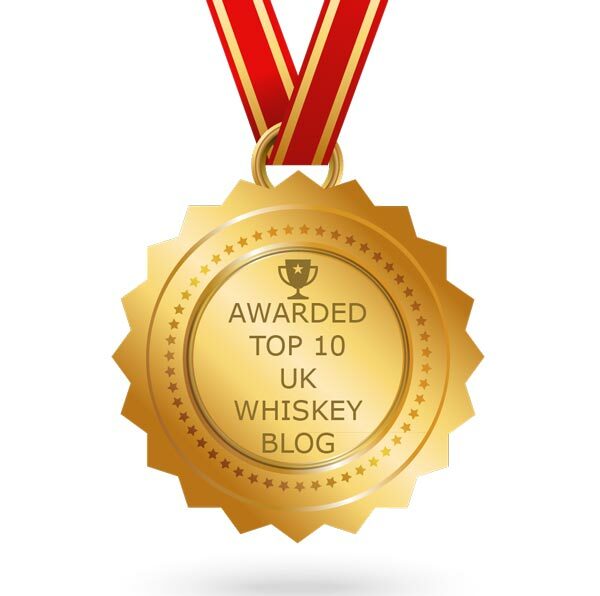 Part 2 will reveal our Top 5 whiskies of 2009, as well as others that just missed out but are deserving of a mention. It will be posted tomorrow. Johnnie Walker is a world famous range of blended whiskies. The Johnnie Walker brand is currently owned by multi national drinks company Diageo, who blend whiskies from across their portfolio of 28 Scottish distilleries. Some of these only operate in order to supply the Johnnie Walker range. The core range consists of the Red Label (which carries no age statement), Black Label (minimum age of whisky in this is 12 years), Green Label (minimum age 15 years), Gold Label (minimum age 18 years) and this legendary Blue Label. No age stated on the Blue Label but the youngest whisky included is rumoured to be 28 years old, with some of the whisky from rare or closed distilleries such as Brora. It contains over 20 rare single malts and superior grain whiskies in total. The Johnnie Walker whiskies are the best selling series around the globe with the Red Label forming the cornerstone of this success. The combined sales of all Johnnie Walker whiskies in 2008 totalled 17.2% of world sales (source - Euromonitor International 2009). Therefore, that equates to the fact that for every six bottles of whisky sold during 2008 in the world, one was either a Johnnie Walker Red, Black, Green, Gold or Blue Label. The iconic Red Label is by far the biggest selling of these, contributing almost 10% of all worldwide whisky sales on its own! The success of the brand is built on the original Johnnie Walker blends being exported around the world during Victorian times. As the British Empire expanded, more people enjoyed the range and brand has never looked back. This is shown in the fact that Johnnie Walker whiskies were already exported to 120 countries before Coca Cola had even left America in the 1920s. The brand and its famous 'walking man' logo are embedded in world culture and pioneered sports sponsorship in the 1960s by sponsoring a motor racing Grand Prix team and other major events, especially golf. The Blue Label is packaged in a blue glass bottle and the whisky has a golden amber colour. The nose is surprisingly subtle with distinct cereal grain (imagine the husks especially) and vanilla notes appearing first. These are followed by some caramel/toffee and a herbal grassy note (think of dried grasses). Through these comes a whiff of soft peat smoke that is reminiscent of bonfire smoke. On the palate this is very soft and silky. It feels rich and very grainy (those husks again), with the beginning being sweet before turning drier. The sweet elements include vanilla, soft dried fruits (imagine sultanas and raisins) and honey. The dryness comes from an oaky woodiness that appears and this feels a little spicy in nature (think of a woody spice like cinnamon). All the flavours on the palate are backed up with that lovely smokiness again, although it seems more earthy than it did on the nose. The finish is of medium length and again starts sweetly (particularly the caramel and grain notes) before becoming dry and slightly spicy (imagine ginger and cinnamon). Johnnie Walker Blue Label is a lovely, mellow, soft whisky that is clearly very intelligently blended. It is easy to see why it is so popular and is one of the most aspirational whisky brands/status symbols to have on your whisky shelf in certain parts of the world . A bottle costs between £140-170 for a 70cl bottle in the UK. Whether it is worth the price compared to cheaper (and equally as good quality) premium blended whiskies such as Chivas Regal 18 years old, only you can decide. Or do people willingly pay extra due to the 'aspirational' marketing and Blue Label's legendary status/kudos in the consumer world. Again, only you can decide! All we can say is that it is a lovely dram that should be tried so that you can see what all the fuss is about. 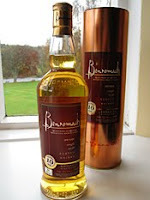 The 'Curiositas' is a peaty, smoky whisky made by the Benriach distillery in the Speyside whisky region of Scotland. The production of a smoky whisky is an unusual practice for a Speyside distillery. Smoky whiskies are more commonly produced on the islands around Scotland, especially the western isle of Islay. Benriach release two - this 10 years old called 'Curiositas' and a 21 years old named 'Authenticus'. These two whiskies form part of one of the most innovative ranges of any Scottish distillery - the expansive regular range is matured in ex-bourbon casks, with an additional range of different casks finished whiskies adding to these two smoky ones. 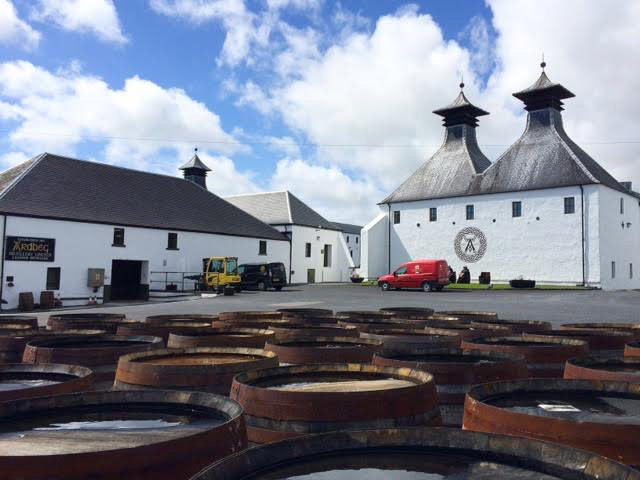 They make peaty whisky at Benriach for roughly three weeks every year. Benriach is located approximately 3 miles to the south of the city of Elgin and the distillery was founded in 1897 by John Duff & Co. They had already built the Longmorn distillery on a neighbouring plot of farmland in 1894. The original name was the slightly unimaginative Longmorn 2, before changing to Benriach in 1899. The distillery currently has a production capacity of 2.8 million litres per year, with most being released as single malts. Benriach had a very short early history – it was closed and mothballed in 1903 and not reopened until 1965, when it was bought and restarted by the Glenlivet Distillers Ltd. It was closed and mothballed again in 2002 by Pernod Ricard, who were the owners at the time. In 2004, an independent group named the Benriach Distillery Company took over the distillery and all of its maturing stock. This group was headed by Billy Walker, a former director of Burn Stewart Distillers, and this makes Benriach one of the few remaining distilleries in Scotland that is independently owned. Benriach 10 years old 'Curiositas' is a very good whisky. It is well balanced and fresh and offers a fantastic and unusual alternative to the heavier island and Islay smoky whiskies. It also offers great value for money compared to these competitors. We had heard that it was an interesting and pleasant whisky, but that description doesn't really do it justice. We opened our bottle on Christmas Day and it was a welcome surprise that it was so good (it goes very well with blue and goats cheeses we also discovered!). 'Curiositas' is a cracking dram from an under-rated distillery and is a 'must try' for all fans of smoky whisky. Merry Christmas and thanks to everyone who read and left comments for our recent ‘mystery dram’ challenge. It has been an enjoyable day for us and we have just finished a huge meal of traditional English roast and bottle of Aussie red wine. The dram has proven to be a welcome diversion after the excesses of all the food we have had. The mystery bottle has just been cracked open and we can reveal that it is BenRiach 10 years old 'Curiositas'. Congrats to Pocket Rocket for being the only one to guess correctly. The tasting notes provided did not quite do the dram justice but were temptingly close. It was as delightful as we had hoped. Full tasting notes will follow shortly to give you the full description. We are now retiring to another dram and a mince pie or two. Merry Christmas! We would like to wish all our readers a Happy Christmas and a good festive period. We would also like thank you all for continuing to read and add your comments to Whisky For Everyone and hope that you enjoy whichever whiskies that you choose to celebrate with. 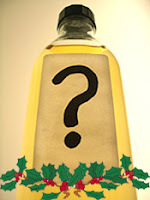 Christmas mystery dram ... what is it? The festive season is not just upon us, it is all but consuming us. To keep the smiles on our faces while we wait, we have set aside a bottle of (hopefully) delicious whisky to be opened on Christmas day. We thought 'what a great idea for a mystery dram as it's a mystery to us as well as to you!'. We have looked at all the great things written about this particular bottle but we won't actually get to try it until Christmas Day, when we open our bottle and taste a dram or two. We will then reveal to all what it is and just how good the tasting notes we have found prove to be. On the nose this rich amber coloured whisky should have a aromatic peat with fragrant hints of honey, fruit (citrus seems to be the suggestion) and gentle oak woodiness. The taste on your palate should be noticeably peaty yet balanced with oaky woodines and warm peppery spices. An 'extravagant and complex' mix of honey sweetness, heather, nuts and barley. The finish is due to be long and clean with vanilla and a hint of cocoa and 'near perfect' bitter sweetness lingering alongside the peatiness. This is a distillers bottling at 40% ABV. It is not from an overly famous distiller but should not be a name unfamiliar to many of you. We are keenly looking forward to the 'Mystery dram' as it has received many good reviews and has a small clutch of awards against its name. Now is the time for you to have a guess. Just let your imagination run wild. The answer will be revealed on Christmas Day along with the names of anyone who made a correct guess. The Christmas festive period is a time when the sales of whisky liqueurs goes through the roof, so we have decided to review a few of them in the lead up to the Big Day. In this second part of our review, we are concentrating on the cream based whisky liqueurs. The first post - Have just tried ... Whisky liqueurs (Part 1) - has proved very popular and featured some of the non creamy whisky liqueurs available in the UK market. It also contains further general information and facts about whisky liqueurs, so please click on the link above to read it. Cream based whisky liqueurs contain two obvious ingredients - whisky and cream! Other than this they can be sweetened with sugar or syrup and flavoured with almost anything, with the most common things being fruit, nuts, honey, spices and herbs. They generally have a lower alcoholic strength (this is called the ABV - alcohol by volume) than the non cream liqueurs and are usually have a strength of 15-20% ABV. Most are recommended to be served chilled or with ice, although they can also be used in desserts and other sweet recipes. We are trying all of these samples chilled from the fridge. This product has just been launched for Christmas 2009 and we have just received our sample from Diageo, who currently own and market the brand. Bailey's is the most well known cream based whisky liqueur and is made with Irish whisky, caramel and cream. The regular Bailey's is the biggest selling liqueur of either type in the world and they also release other bottlings in the range that are flavoured with mint, chocolate and orange. All are bottled at 17% ABV. The Original was released in 1974 and was the first whisky liqueur to be made with cream. The colour of this new Bailey's Coffee is like that of a milky coffee/hot chocolate and the nose is reminiscent of instant coffee and hard boiled coffee caramel sweets. On the palate, this is very viscous and has the feeling of condensed milk. It has butter, toffee, coffee (instant coffee again) notes and a touch of alcohol burn in the background. The finish is short and sweet but leaves your mouth covered in thick buttery liquid. Ice would definitely help to stop this being so cloying but the flavours are pleasant and enjoyable. A 70cl bottle should cost £10-12. This liqueur is a mixture of single malt whisky, honey and cream. It is named after St. Columba who arrived on the western Scottish isle of Iona in 563 AD. The link is that the single malt included is made at Tobermory, a distillery on the neighbouring island of Mull. It is bottled at 17% ABV and is available in 70cl, 35cl and 5cl bottles (a 70cl bottle should cost £15-18). The colour of Columba is reminiscent of latte coffee and the nose smells incredibly sweet with lots of sugary honey coming through. On the palate, this is rich, creamy and extremely sweet - there is a lot of caramel, honey and toffee-like notes present and it sticks to your mouth and it is hard to shift! No whisky is detectable. The finish is short, very sweet and cloying. Keep a glass of water handy, your palate may need it! Or to give it its full name Mrs. Walker's Drumgray Highland Cream. This liqueur follows an original recipe that a Mrs. Walker used to follow on her central Highland farm. It is made using single malt whisky from the Deanston distillery and cream. Drumgray is sold in 70cl, 35cl and 5cl bottles (a 70cl bottle should cost £10-12) and has an alcoholic strength of 17% ABV. The liqueur has the colour of a Cappuccino coffee and the nose has some malted barley, toffee and caramel notes. It gives the impression of being rich and sweet. This is backed up on the palate - it is rich, almost sticky and coats the inside of your mouth. There is again toffee, caramel and cereals but the silky, velvety nature is tainted by some harsh alcoholic burn. The finish is long and sweet with the alcohol burn particularly prominent. This liqueur was first produced in 1980 and is a marriage of Balblair single malt whisky and fresh cream (it is one of the few to be made with fresh cream). It is marketed as the 'Cream of Scotland' and is released in 70cl, 35cl and 5cl bottles at 17% ABV (a 70cl bottle should cost £12-15). Heather Cream has a very pale colour (think of very milky tea) and the nose is subtle and delicate. 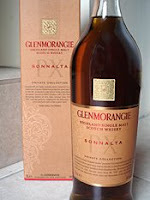 There is some sweetness (imagine toffee) and cream with some maltiness from the whisky coming through. On the palate, this is fresh, clean and not as cloying as some of its competitors. It feels silky and light with some lovely caramel, toffee, cereal and vanilla notes present. The finish is pleasantly long with the caramel note coming through well. 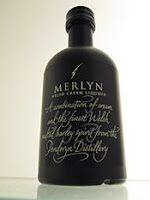 This is a cream based whisky liqueur made by Penderyn, the only Welsh single malt whisky distillery. It is named after the famous Welsh wizard who features in the Legend of King Arthur tales. The liqueur is only made in small batches and is only sold in 70cl and 5cl bottles (a 70cl bottle should cost around £15-18). The colour is very light and milky and the nose is light and subtle but with some interesting elements - caramel, honey, malty cereal grains and a touch of grassiness (imagine dried grass). This is delicate on the palate with the fresh cream, honey and whisky combining well. The finish is short and refreshing - the honey is predominant but the cereals and grassiness of Penderyn's whisky comes through. Definitely our favourite! Glenfarclas is a distillery located in the Speyside region, close to the small town of Ballindalloch. It is owned by J&G Grant and is the second oldest family owned distillery in Scotland - the Grant’s have owned it since 1865. Only the Springbank distillery in Campbeltown has been owned by the same family line (the Mitchell family) for longer. Glenfarclas translates as ‘the valley of green grass’ from Gaelic. The distillery has an annual production capacity of three million litres and boasts the largest stills in Speyside. They are reknowned for their use of quality European sherry oak casks for maturation and release a comprehensive core range of single malt whisky. Glenfarclas was voted ‘Distillery of the Year’ in 2006. George Hay founded a distillery on the current Glenfarclas site in 1836, although records show that an illegal farm distillery had been operating there since 1797. He named the distillery Rechlerich. In 1865, it was sold to neighbour John Grant and here started the second longest continuous line of family ownership in Scottish whisky history. In 1896, the distillery was completely rebuilt by John’s son, George, and with that came increased production and success and the change of name to Glenfarclas. The distillery continues to be owned by the Grant family to this day and the core range includes a 10, 15, 21, 25 and 30 years old plus other limited single cask releases. The colour of this Glenfarclas 21 years old is golden amber and the nose is full of Glenfarclas' reknowned sherry cask influence (think of caramel, dried fruits - sultanas, candied orange peel/zest and woody spices such as cinnamon and nutmeg). In fact, initially it could almost pass for a full bodied sherry but other richer elements start to come through, especially a distinct cereal graininess and nuttiness (think of hazelnuts and walnuts) that identify this as a whisky. On the palate, this is warming, creamy and velvety. 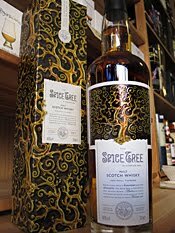 It feels thick and coats your mouth with classic sherry cask flavours - dried fruits (think of a combination of sultanas, candied orange peel and apple), nuts (those hazelnuts and walnuts again), caramel and spices (imagine ginger, cinnamon and nutmeg). There is also a lovely malted barley note, some vanilla and a further sweet element that is reminiscent of honey. The finish is long, sweet and fruity with those spices coming through well at the end. 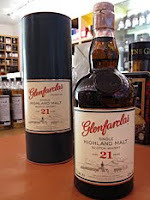 This Glenfarclas 21 years old is a classic Speyside whisky. It is rich, easy drinking and complex and if you love sherry cask matured whiskies, then this is one that you simply have to try. Having said that, it will also appeal to beginners and drinkers who like other styles of whisky, as it is so soft and silky and exhibits so many interesting characteristics. This whisky also offers great value for money (as does the rest of the Glenfarclas range), considering its age and the price of similarly aged competitors. A bottle should cost around £50-55. A cracking dram. Chivas Regal is one of the most famous and best selling whisky brands in the world. The whiskies that appear under the Chivas Regal name are blends and the core range consists of a 12, 18 and 25 years old. The age statement refers to the age of the youngest whisky that is included in the blend. This is true of any blended whisky that carries an age statement. This Chivas Regal 18 years old contains a complex mix of over 20 single malt and grain whiskies, the youngest of which is 18 years of age. The Chivas Regal range is the second biggest selling range of blended whisky in the world, behind only the famous Johnnie Walker range. The Chivas Brothers company was originally set up in the early 1800s by James and John Chivas. They owned a luxury grocery store in Aberdeen that imported highly desirable products such as brandy, rum, port, spices, tea and coffee, which they sold to their wealthy customers. They began blending their own whiskies, as was the trend at the time. Chivas Brothers' whiskies became so popular in late Victorian times that Queen Victoria issued them with a Royal Warrant and they supplied the royal household for a period of time. From this act, the name of Chivas Regal was born. Chivas Brothers and the Chivas Regal brand is currently owned by drinks company Pernod Ricard, who purchased it in 2001, and they have helped to grow the stature and sales of the whisky around the world. This 18 years old is bottled at 40% ABV and offers good value for a premium blended whisky at £40-45 a bottle. 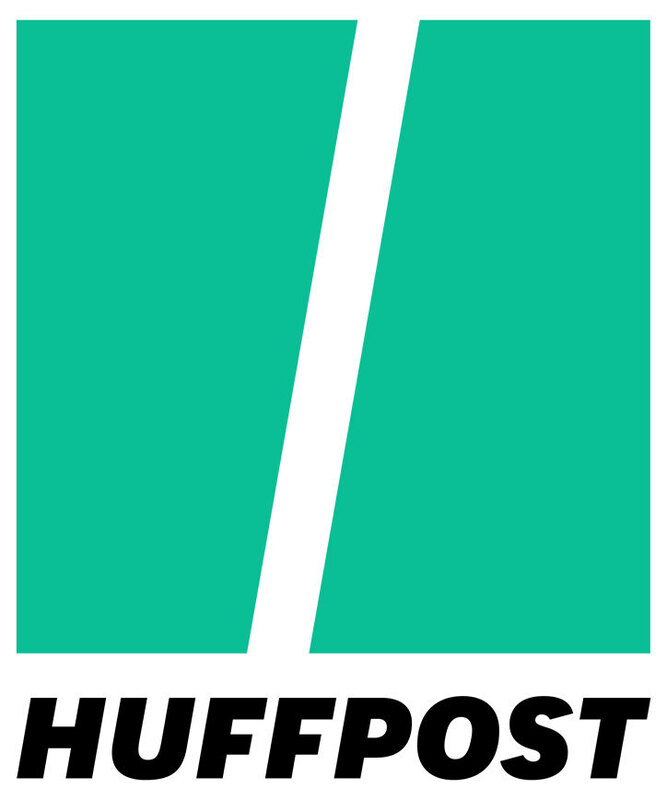 It is widely available in supermarkets, liquor stores and Duty Free retailers around the world, although its main markets are the USA, southern Europe, Japan and south east Asia. The colour is golden and the nose is fragrant and welcoming. First comes some vanilla and cereal grains (think of oat cakes or porridge oats) and these are joined by plenty of dried fruit notes (imagine a combination of sultanas, apricots, prunes and candied orange peel) and some woody spices (think of cinnamon and nutmeg). On the palate, this is soft, velvety and very smooth. The vanilla and grain notes are present from the nose, as are the sultanas and candied orange. However, the fruitiness is now more reminiscent of stewed/cooked fruits (especially pears and apples) and this combines well with the woody spicy notes from the nose (cinnamon and nutmeg). There is also an element of toffee adding to the richness. The finish is long, warming and rich with the stewed fruitiness and woody oaky vanilla particularly prominent. 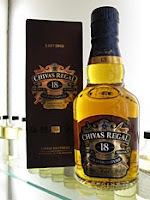 Chivas Regal 18 years old is one of the nicest blended whiskies that we have sampled to date. It is well balanced, complex and delightfully easy to drink, making it perfect for the whisky beginner and connoisseur alike. We believe that it would be a great after dinner dram and plan to have it with our dessert and cheese platter on Christmas day - the rich fruitiness and level of sweetness should make it a great match for this. Chivas Regal 18 years old offers an excellent value for money alternative to its costlier premium blended whisky competitors such as Johnnie Walker Blue Label (which should cost £150-170 a bottle). Our thanks go to Sam Harrigan and Pernod Ricard USA for supplying us with this sample. Christmas is here and it is the time of the year when whisky sales go through the roof. Another area of the market that is extremely popular and records high sales during the festive period is that of whisky liqueurs. These liqueurs attract a new and different set of drinkers to the world of whisky and are consumed in a different way to single malt or blended whiskies. They are commonly sweet and can be served as a dessert (on their own or incorporated with something else), with coffee or cream, in a cocktail or over ice. The origin of the word liqueur is allegedly derived from the Latin word liquifacere, which is a verb and translates as ‘to become liquid’. Others say that it is derived from the French word liquor. The term ‘liqueur’ relates to an alcoholic drink that has been sweetened with sugar and then flavoured with something. This flavouring can be almost anything and the most common are fruit, nuts, honey, spices, herbs or cream. In the case of whisky liqueurs, whisky is the main ingredient that has then had sugar and other ingredients added. The ingredients are usually infused or macerated together and left for a short period in order for the flavours to marry together. Most whisky liqueurs have an alcoholic strength (called the ABV) of between 15-35%. Whisky liqueurs are made around the globe and most fall in to two categories - cream liqueurs or non-cream liqueurs. A famous example of a cream liqueur is Bailey's, an Irish whisky liqueur that is the biggest selling whisky liqueur in the world. Two well known non-cream liqueurs are Drambuie and Glayva. A number of Scottish distilleries release their own versions of whisky liqueurs and the well known ones include Macallan Amber, Glenfiddich Malt Liqueur, Arran Gold and Edradour Cream. American whiskies are also used in liqueurs with the most well known being Southern Comfort and Wild Turkey American Honey. 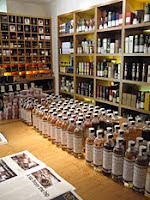 There are many products available and we have sampled a few of whisky liqueurs on the market. We have split our reviews in to two parts, beginning here with some non-cream whisky liqueurs. 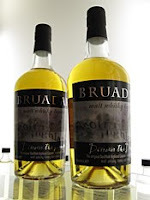 Bruadar is a whisky liqueur that is made from single malt whisky, honey and sloe berries. Bruadar means 'dream' in Gaelic. This liqueur is sold in 70cl, 35cl and 5cl bottles with a 70cl bottle costing £15-20. It has an alcoholic strength of 22% ABV and was formerly known as Scottish Highland liqueur. The colour of Bruadar is light and straw-like with a fresh nose that contains obvious honey and the fruity, bittersweet sloe berries (if you have ever tried sloe gin, then it has the same dark fruity aroma). On the palate, this is again light, sweet and fruity (the sloe berries again) and some malty cereal notes and vanilla come through. The finish is short and sweet although the sloes and the whisky give an interesting bitter note right at the end. 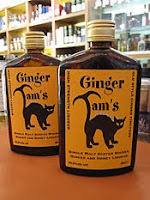 This Ginger Tam's is a whisky liqueur with a kick! It is made from whisky, honey and ginger and is bottled at the high alcoholic strength of 48% ABV. This makes it much stronger than most other liqueurs and as a result is only sold in 35cl and 5cl bottles. The liqueur is a golden orange in colour and the nose is packed with prickly, fiery fresh ginger and sweet floral honey (think of heather honey). On the palate, this is powerful! The ginger is more like crystalised ginger now and there the associated lovely root-like earthiness. There is plenty of thick honey and vanilla, but not much whisky is detectable. The finish is fiery and the earthy ginger burns away for ages. This would make a great 'hot toddy' and would sort out a sore throat! It is powerful, cloying and sticks to the inside of your mouth. Not for the faint hearted. This liqueur is made with Old Pulteney single malt whisky, honey, spices and a combination of natural herbs. 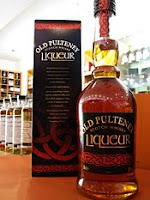 Old Pulteney is a distillery that is located in the north Highland town of Wick. It is the most northerly distillery on mainland Scotland. The liqueur is bottled at 28% ABV and is available in 70cl and 5cl bottles, with a 70cl bottle costing £15-20. The colour is dark golden orange and the nose has honey and a malty cereal note to it. There is also a touch of herbal grassiness (think of dried grasses or hay) and a strange aroma that reminded us of washing up liquid. On the palate, this liqueur is thin and slightly prickly. There is some lovely sweet honey, dried fruits (imagine sultanas), vanilla, and candied orange peel that combine well with the more bitter grassy element. The shortish finish is sweet, syrupy and full of honey. This liqueur is made from single malt Highland whisky and fermented honeycomb. It has been produced by Miekle's of Scotland since 1989 and is one of the most popular whisky liqueurs in the UK. 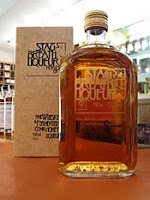 The liqueur is bottled at 19.8% ABV and is sold in 70cl, 35cl, 10cl and 5cl bottles. A 70cl bottle should cost £15-20, depending on where you find it. The colour is golden and the nose is sweet and honeyed - you can detect the waxiness of the honeycomb. On the palate, this is surprisingly light and refreshing. It is sweet and fresh with lots of soft honey. Nothing else is detectable (including any whisky) and it feels like a liquified cold and flu lozenge. The finish is short, refreshing and quite sharp with the influence of the whisky being minimal. Basically, this is good but tastes like alcoholic honey! The Drambuie image at the beginning of this post is taken from The Great Spirits Baking Company, whose website we have recently discovered and contains many products and ideas for recipes that use liqueurs and other spirits. Benriach distillery is located approximately 3 miles to the south of the city of Elgin in the Speyside whisky region. The distillery was founded in 1897 by John Duff & Co, who had already built the Longmorn distillery on a neighbouring plot of land in 1894. The original name was the slightly unimaginative Longmorn 2, before this was changed to Benriach in 1899. The distillery currently has a production capacity of 2.8 million litres per year, with most being released as single malts. Benriach had a very short early history – it was closed and mothballed in 1903 and not reopened until 1965, when it was bought and restarted by the Glenlivet Distillers Ltd. It was closed and mothballed again in 2002 by the owners at the time, Pernod Ricard. In 2004, an independent group named the Benriach Distillery Company took over the distillery and all of its maturing stock. This group was headed by Billy Walker, a former director of Burn Stewart Distillers, and this makes Benriach one of the few remaining distilleries in Scotland that are independently owned. The Benriach single malt core range is extensive. The regular range is matured in ex-bourbon casks and consists of this 12 years old, then a 16, 20, 25 and 30 years old. There is also the 'Heart of Speyside', which is a younger whisky with no age stated. Benriach is an innovative distillery and a number of their single malts are part-matured (or 'finished') in other types of casks. This range includes whiskies 'finished' in Port, rum, Madeira, Sauternes and sherry casks. They also produce a smoky, peaty whisky, which is an unusual practice for a Speyside distillery. Smoky whiskies are more commonly produced on the islands around Scotland, especially the western isle of Islay. This range has a 10 and a 21 years old. This 12 years old is golden yellow in colour and the nose is clean, fragrant and tempting. It feels fresh with four main elements coming through - vanilla, sweet honey, oak and malted barley. On the palate, this Benriach has a light to medium body that freshens up your mouth. The sweet malty cereal grains and a distinct nuttiness (think of almonds) start things off and are quickly joined by some creamy vanilla, oak, coconut and honey notes. A lovely mild warm spiciness comes through (imagine nutmeg and ginger) and this compliments the other elements present. The finish is mouth watering and a little zingy with a good combination of the vanilla, honey and spices. 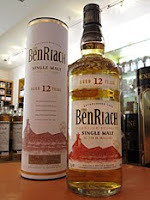 This Benriach 12 years old is a very enjoyable whisky and while not being the most complex, it is a cracker for the price (£25-30 a bottle). It would be ideal to introduce a beginner to the world of single malts and is a good example of a bourbon cask matured whisky, demonstrating all the classical characteristics. A classic and under rated Speyside whisky. This Dalmore 18 years old has been recently released in Autumn 2009 and is a limited edition bottling. Only 3000 bottles are to be sold worldwide and there has been much expectation as it is the first time that Dalmore have ever released an 18 years old whisky. It joins the 12 and 15 year olds, as well as the rarer Gran Reserva and King Alexander III bottlings that form Dalmore's core range. The whisky has been matured firstly in American oak ex-bourbon casks before transferring to sherry casks. It is bottled at an alcoholic strength of 43% ABV and can be purchased in specialist whisky and alcohol stores, costing approximately £85 a bottle. The Dalmore distillery is located in the northern Highland town of Alness. It was founded in 1839 by Alexander Matheson and has been owned by the current owners, Whyte & Mackay, since the 1960s. Whyte & Mackay are now part of a larger Indian owned company called United Spirits, who also own the Jura, Fettercairn and Tamnavulin distilleries in Scotland. The capacity of Dalmore in 4.2 million litres per year, although recently the average has been approximately three million per year as they consistently have water shortage problems during the warmer summer months. The whisky produced there is shared between being released as single malts and contributing to the popular Whyte & Mackay blended range. Dalmore single malt sales have increased rapidly in the last five years as they have re-branded and expanded their range. The colour of this new 18 years old is dark golden amber and the nose is very pleasant, sweet and rich. There is plenty of malted barley that is quickly joined by the classic sherry cask characteristics - dried fruits (think of raisins and sultanas), candied peel (especially oranges), nuts (imagine walnuts and almonds) and caramel. On the palate, this feels full bodied and silky with the sherry cask notes from the nose prominent. There is plenty of dried fruit, especially raisins, and this is complimented by a lovely woody and nutty spiciness (think of a combination of cinnamon, nutmeg and walnuts). In addition, there are other elements - the slightly bitter candied orange peel, caramel, vanilla and a hint of something darker that is reminiscent of dark plain chocolate/cocoa powder and roasted coffee. The finish is rich, fruity (the dried fruit and candied peel again) with a warm spiciness (imagine cinnamon with some cloves?). 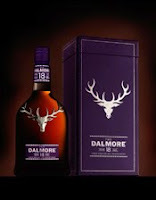 This new Dalmore 18 years old is a lovely, rich and smooth whisky. It is well worth a try, especially if you like your fruity sherry cask matured whiskies or if you drink other richer spirits such as dark rum, Cognac or Armagnac. We thank Richard Lewis of Whyte & Mackay for the opportunity to sample this dram. For further information on Whyte & Mackay then go to www.whyteandmackay.co.uk or follow their Master Blender, Richard Paterson on his Master Blender blog or on Twitter as @the_nose. Which whisky should I buy for Christmas? Christmas is approaching fast, the decorations are going up and people are starting to panic about what presents they are going to buy. Christmas is also a time when people buy whisky either to enjoy themselves over the festive period or to give as a gift. For many of these, it may be the only time in the year that they purchase a bottle of whisky and it can be a daunting experience to go into a supermarket or specialist retailer. Which one of the vast array on the shelves is the right one to go for? 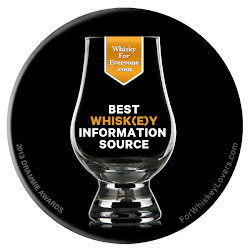 Here, we at Whisky For Everyone will try to help with a few suggestions and things to think about. 1 - A common misconception is that you need to know loads about whisky to buy something other than the big popular brands. This is not true. How much you know about whisky is not important - what has to be considered is what you think you would like or what the person that you are buying the gift for would like. If you are not sure, then think what other things and flavours that you or the person receiving the gift usually enjoy. This can be other spirits, wine, food etc - do you/they enjoy strong, rich flavours or something lighter and fresher? This will give you some clues. It may be that you enjoy a particular whisky or know a whisky that the recipient of your present likes. 2 - Budget is an important consideration. Set an upper limit and stick to it. Single malt whiskies start around £20 for a 70cl bottle and most will be under £50. Blended whiskies can start for as little as £10 (sometimes even less if it is a supermarket own brand). Of course, there are whiskies that can fit any budget with some costing hundreds and even thousands of pounds! 3 - Where to start? There are a few options - specialist whisky retailers, supermarkets, liquor stores and the internet. Specialist retailers (as pictured left - The Whisky Shop, London branch) offer a wider range of whiskies and knowledgeable staff who will help you make a decision. These shops can be daunting but if you go in having considered the first two points, then they will be able to recommend you some great choices. Supermarkets are different in that they sell the products but staff may not know a great deal about them, especially as many have cut back on specialist wine and spirit staff in the recession. The distilleries help you here, as many of them now print basic tasting notes on their packaging and this will give you an idea if you like the sound of it or not. Liquor stores can vary from the knowledgeable to the clueless. Knowledgeable stores can be up there with the specialist retailers but the clueless can offer some real hidden gems and great bargains. The trick is to pop in for cheaper beer or wine and have a nose around, then do a little research on the bottles you have spied. 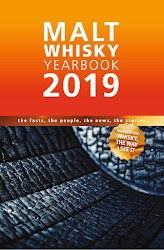 With the internet there are many places to buy whisky and many of these print helpful tasting notes on each page, with some giving more information, customer reviews and distillery facts to help you make your choice. This can be described as light, clean, delicate, fresh and crisp so look out for these words on packaging. Key flavour characters may be vanilla, cereal grains, nuts, grassiness (fresh or dried) and floral. Famous examples of this style are the Glenfiddich 12 years old, Glenmorangie Original and Glenlivet 12 years old. You could go for one of these as they are all very good and are some of the best selling whiskies in the world but what if you want something different. There are some very under rated whiskies in this category and ones worth considering included Glen Grant, Speyburn and Glengoyne which all release good 10 year olds. Also, there is the Benriach 12 years old and for something slightly different, try the Japanese single malt Yamazaki 10 years old. These whiskies are much fuller bodied, sweeter and richer than the previous category. They can be described as thick and creamy and have key flavour words such as caramel, dried fruits and citrus peel, spicy and toffee. The Macallan 10 years old is the best selling and most well known brand of this style of whisky. 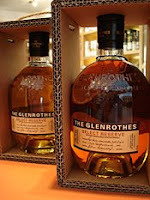 There are many others worth considering including the Glenrothes Select Reserve and Glenfarclas 10 years old, which are reasonably common. The Tomintoul 10 years old and Glendronach 12 years old are harder to find but worth tracking down. If you are wanting something non-Scottish then look towards something like the Bushmills Black Bush or a bourbon such as Bulleit Bourbon or Maker's Mark. Most bourbons would fall in to this category. This category is relatively small compared to the others. Generally, they are more robust but not always and have some of the peaty, earthy, smoky flavour and aroma but not as much as the next category. They tend to be from the islands around Scotland, but not always. The most well known examples of this style are the Talisker 10 years old, Highland Park 12 years old and Bowmore 12 years old. 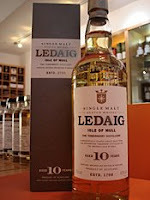 Other examples worth checking out include Ledaig 10 years old and Jura Superstition. Some whiskies have just the slightest hint of smoke and many people enjoy these as it is not too overpowering - Clynelish 14 years old, Springbank 10 years old and Glenfiddich Caoran Reserve 12 years old. These are the big, heavy whiskies that are normally from the western Scottish island of Islay (although, again not always!). These will be labelled as rich, peaty, robust, fiery, earthy and smoky. If you see the word 'Islay' on an own brand supermarket whisky then 99 times out of 100, it will be in this style. The most famous and best selling brand of this typr of whisky is the Laphroaig 10 years old. Laphroaig (pronounced la-froyg) release another whisky in this £30 price bracket that is also very good and this is called Quarter Cask. 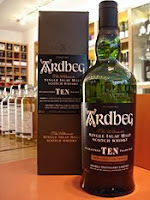 Other quality whiskies to look for in this smoky style include Ardbeg 10 years old, Caol Ila 12 years old and Smokehead. If you want something smoky but not from Islay, then try the Benriach 10 years old 'Curiositas' or Longrow CV. For further tips and suggestions on more expensive whiskies and other whisky related Christmas gifts, check out 'A whisky gift guide (2009)' on the excellent Scotch Hobbyist blog and 'Christmas picks 2009' by the legendary Dr. Whisky. 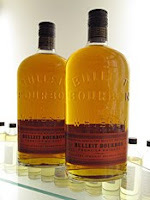 Bulleit Bourbon is a multi award winning American whiskey. It was first created by Augustus Bulleit in the 1830s. Bulleit had moved to America from France in the early 1800s and lived in New Orleans, until moving to the state of Kentucky in 1830. Kentucky is the heart of America's whiskey industry and Bulleit, who had produced brandy in France, fell in love with bourbon and decided to make his own. He experimented with different recipes before settling on one that contained malted barley and a particularly high percentage of rye. Bulleit produced his bourbon in small batches and its popularity grew rapidly. In 1860, Augustus Bulleit mysteriously disappeared and with no-one to take over, the distilling was stopped shortly afterwards. The Bulleit name was re-introduced to the American whiskey industry by Augustus' great great grandson in 1987. His name is Tom Bulleit and after finding some of Augustus' old documents and bourbon recipes, he decided to recreate the whiskey. He has tried to stay as close to his great great grandfather's recipe as possible, including the high level of rye (this is around 30% of the grain mix, which is more than most bourbons). Bulleit Bourbon hit the American market in 1999 and one year later it was introduced in to the Australian, European and UK markets. The brand is now owned by drinks giant Diageo and is made under license at the Four Roses distillery in Lawrenceburg, Kentucky. The whiskey is made in small batches, is aged for at least six years in charred oak casks and is one of the fastest growing bourbon brands in the USA and the world. The UK version of Bulleit Bourbon is bottled at 40% ABV (it is 45% in the USA) and is golden amber in colour. The nose is fragrant with an aromatic combination of vanilla, toasted nuts (think of almonds), candied orange peel, cereal grains and a distinct woodiness (imagine wood shavings). On the palate, this is dry and fresh with a prominent spiciness coming from the high rye grain content (think of cinnamon and nutmeg). There is again plenty of vanilla and toasted nuts and these are joined by sweeter honey, caramel syrup and coconut notes. Another slightly odd characteristic also comes through and this is hard to place. The closest we got was that it was reminiscent of some sort of tropical fruit. The finish begins slightly sweet before turning dry and spicy with an almost smoky edge (hard to pinpoint again but imagine cigar tobacco?). Bulleit is a lovely, rich and spicy whiskey that is slightly different from other bourbons that we have tried in that it has a drier feel. It is popular in bars and with cocktail mixologists and is available from specialist whisky retailers and some larger supermarkets. In the UK, it is also available in the Wetherspoon's chain of pubs for around £2 a go (which is where we sampled it), so this offers a good chance to try before you buy a full bottle (which should cost around £20). Glen Grant is a distillery located in the town of Rothes in Scotland’s Speyside whisky region. It is a large distillery that has a capacity of 5.9 million litres per year and is currently owned by Italian drinks company Campari Group. 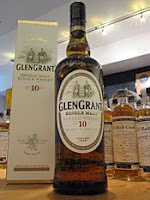 Glen Grant is popular with blending companies and is one of the best selling single malts in the world. It has been as high as second place in the world sales charts but currently sits in fourth behind only Glenfiddich, Glenlivet and Macallan. The majority of Glen Grant single malt is sold in mainland Europe, with Italy being its main market. The distillery was founded by James and John Grant in 1840. They were brothers and decided to use their surname for the distillery name. The name Glen Grant has stood ever since. It remained in their direct ownership until 1872 when James died (John had died in 1864) and the distillery was inherited by James’ son, James Grant Jnr. The distillery remained in the ownership of the family until Grant Jnr’s grandson, Major Douglas Mackessack, sold it to Canadian group Seagrams in 1972. After numerous subsequent takeovers, the Campari Group took control in 2006 and re-launched the range of single malts with new packaging in 2007. This whisky has been matured for a majority of its time in bourbon casks but then transferred for the last year to sherry casks. The colour is golden and the nose has richness and interesting character – there is sweet vanilla, fresh crisp green fruit (pears and apples especially), dried grass, oaky wood, dried fruit (think of sultanas) and a hint of spice (imagine cinnamon). On the palate, this is packed with vanilla and cereal grains, feeling creamy and soft in your mouth. The grass and oak elements come through as do the subtle sherry cask influences – the dried fruit and woody spices (add in some nutmeg and cinnamon now). The mix of all the elements is interesting - the vanilla and dried fruits supply a lovely level of sweetness, while the cereals and dried grassy notes give a slightly herbal bitterness that creates balance. The finish is relatively short but very pleasant and soft with the oak, dried fruit and spices prominent. This Glen Grant 10 years old is a lovely and under-rated dram that only costs around £25 a bottle. On our recent visit to the Glen Grant distillery we were surprised by the quality of it for the price, liked it and bought a bottle! It would be a perfect whisky to use as an introduction to a whisky beginner as it is so soft, rounded and easy to drink. Smokehead is a whisky released by Ian MacLeod Distillers. This 18 years old is a new premium single malt that joins the regular Smokehead, which was first released in 2006. The Smokehead brand offers quality whisky with a contemporary edge and this is reflected in the innovative graphics, design and website (www.smokehead.co.uk). Ian MacLeod Distillers own the Glengoyne distillery near Glasgow, as well as the Chieftain's and Dun Bheagan independent bottling brands. They also own various other spirits brands such as London Hill gin, Rostov vodka and Watson's rum. As the name suggests, this whisky is smoky and named as an Islay (the island off the west coast of Scotland) single malt but the distillery is not revealed. The serious rumour is that this 18 years old is from Ardbeg. If this is true, then this makes Smokehead 18 years old the only way to currently get an Ardbeg of this age without breaking the bank. The other distilleries that it is rumoured to possibly be are Caol Ila or a heavily peated version of Bunnahabhain. The Smokehead 18 years old is a limited release with just 6000 bottles available worldwide. A bottle should cost £85-95 from specialist whisky and spirit retailers. Smokehead 18 years old is light golden in colour and has a powerful nose that is packed with peaty smoke. This smokiness is heavy and a little tarry in nature but some other pleasant characteristics come through well - some honey, vanilla, nuts (think of almonds and hazelnuts) and a touch of citrus sharpness (imagine lemon zest). If you thought the nose was potent, then prepare yourself for the next step. On the palate, this again has a shovelful of hot peat but here the smokiness is more spicy and reminiscent of black peppercorns and red chillis. The sweet vanilla, oaky wood, pronounced cereal grains and honey come through well again. The citrus tang is present also and cuts through the heavy richness to freshen things up and create a lovely balance. The finish turns dry and woody with a bitter nutty edge (those almonds and hazelnuts again), a hint of saltiness and iodine present. Smokehead 18 years old is a lovely smoky, spicy and luxurious dram that packs a proper punch. Definitely one for the peat lovers to try and not for the faint hearted! We thank Charles Miller from Harvey-Miller, the distributors of the Smokehead range, for the chance to sample this whisky. Glenfiddich released their 50 years old single malt earlier this year to much publicity and now they have announced that a bottle is going up for auction next week. This is only the second time in the distillery's 123 year history that a 50 years old whisky has been released! Glenfiddich is the most famous whisky distillery and single malt brand in the world. The distillery is located in the Glen Fiddich, a valley on the outskirts of the town of Dufftown in the heart of the Speyside whisky region of Scotland. The name means 'valley of the deer' in Gaelic and it was founded in 1886 by William Grant and his family. The Grant family maintain ownership today and the success of their whiskies have made Glenfiddich the biggest distillery in Scotland. The annual production is a massive 10 million litres with 29 stills and 45 maturation warehouses, its own cooperage and bottling plant (very few distilleries have all of these facilities remaining on the same site). The charity auction of the Glenfiddich 50 years old will be conducted by Christie's, the famous auction house, on Monday 7 December. The charity in question is Friend's of Scotland, which was started by Sir Sean Connery and aids Scottish causes in the USA. Part of the deal is that he is going to write a personal letter of congratulation to the winning bidder. The event will take place in New York, with two other simultaneous events joining in from Los Angeles and Miami, and will be hosted by the USA Glenfiddich ambassadors. The whisky is presented in a hand blown, specially designed glass bottle and is individually numbered (the bottle for auction in number 3). It is presented in a hand stitched leather case. The whisky is a marriage of two casks that have been maturing in Glenfiddich's warehouses since 1959 and they were carefully selected and vatted by Scotland's oldest serving Master Blender, David Stewart. As the Glenfiddich 50 years old is an extremely rare and prestigious whisky, (and it costs a whopping £10,000 a bottle! ), we will have to use Glenfiddich's own tasting notes to convey the characteristics - "The nose is beautifully harmonious with an uplifting, vibrant and complex aroma. The taste is initially sweet with a zesty orange marmalade and vanilla toffee, which then cascades through a wonderful series of layers: aromatic herbs, floral and soft fruits, silky oak tannin and hints of gentle smoke. The finish is exceptionally long with a touch of dry oak and the merest trace of peat." Kavalan whisky is a new venture by the King Car Corporation in Taiwan. King Car was set up in 1979 and has grown to be one of Taiwan's biggest beverage and food manufacturers. Taiwan's whisky drinking population has grown considerably over the last two decades and the chairman of King Car decided to build his own whisky distillery. This new facility is one of the most technically advanced in the world and is located in Yuanshan, a town in the north of Taiwan. Yuanshan lies to the south of the major cities of Taipei and Keelung and close to the Pacific coast. It has copper stills that were constructed in Scotland and the distillery has an annual capacity of approximately six million bottles. King Car decided to name their whisky range 'Kavalan' after a group of indigenous people who lived in the Yi-Lan County where the distillery is based. The range of whisky is currently small and consists of a single malt, a blend and the Solist collection, which are three single cask single malts - this one from a bourbon cask, a sherry cask and a Madeira cask. The Kavalan whisky has been created, selected and blended by the legendary Dr. Jim Swan, the Master Distiller at Penderyn distillery in Wales. He is a worldwide authority in the field of alcoholic beverages and has consulted with numerous distilleries, breweries and wineries over many years. This Kavalan Single Malt, from the core range, is bottled at 40% ABV and is matured in ex-bourbon casks. It is currently only available in Taiwan and major cities in China, with a bottle costing around £40. The whisky is only three years of age, but whisky ages much faster in Taiwan's warm and humid climate, losing around 10% of its volume each year to the angel's share (the angel's share is the name given to the evaporation of the spirit while maturing in the cask). In comparison, this figure is around 2% a year in Scotland. We would like to thank Ian Chang, the Head Distiller at Kavalan, for giving us this sample. The colour of this Kavalan Single Malt is golden and the nose is full of fresh bourbon cask characteristics - vanilla, cereal grains, oak, coconut and honey. There is also a slight herbal grassy note that comes through (think of dried grasses especially). On the palate, this whisky is fresh, zingy and vibrant with the vanilla and fresh oak prominent. A lovely sweetness is present that evolves from the malted barley and is reminiscent of honey. The coconut element is joined by almonds, a zesty lemon note and that dried grassy note again. The finish is of medium length and remains fresh, simple and full of vanilla oak and cereal grains. This Kavalan Single Malt is an uncomplicated but very enjoyable and easy drinking whisky. The intense ex-bourbon cask characteristics and the extra sweetness and creaminess from these result in a whisky that is closer to a bourbon than a Scottish or Irish whisky. It can easily be sampled on its own or would suit a mixer well and is definitely worth a try if you ever get the chance to or are in that part of the world. We have already reviewed another Kavalan whisky - the Solist, a single cask release - which we preferred as it was more complex and rounded. The future looks promising for this new distillery and it will be interesting to see how the range of Kavalan grows and what other products will be released.